can save the riverine rabbit! A conservancy is an area established by a voluntary agreement between landowners or land users to manage the environment. It is a national strategy whereby conservation objectives are achieved through commitment and cooperation. 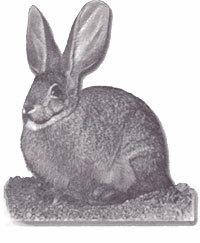 The riverine rabbit is the most endangered mammal in South Africa. This nocturnal browser's habitat is restricted to deep silt flood plains of seasonal Karoo rivers - and is found nowhere else in the world. The riverine rabbit rarely lives longer than three years and only raises an estimated four offspring during its lifetime. The destruction and fragmentation of habitats pose severe threats for the future of this extremely rare rabbit. Favourite foods such as the river ganna have been cleared to make way for crops. Nowhere does any of its natural habitat fall within any formal protected area. The survival of this species depends on the landowners that participate in a network of conservancies to conserve the remaining habitats and form an extended riverine rabbit conservation area. To form a conservancy, invite all interested parties to a meeting. Ask the local nature conservator or spokespeople from established conservancies to facilitate the meeting and share relevant information. Form a steering committee to get the ball rolling. Are you interested to know more about the riverine rabbit? Would you like to be part of an effort to save this species? Would your neighbours be interested? Could a body of landowners that join forces for conservation benefit you in more than one way? If YES, please contact us! South Africa has the oldest wine industry outside of Europe and the Mediterranean, featuring Chardonnays, Pinot Noir, Merlot, Cinsault, Riesling, Shiraz, Sauvignon Blanc, Caberbet Sauvignon and Pinotage varietals.